Reforestation protects the environment, increases food supply and income. Global reforestation is an important environmental issue of growing concern. International programs like the United Nations Initiative for Reducing Emissions from Deforestation and forest Degradation (UN-REDD) are key for implementing global programs for reducing deforestation, emissions through reforestation and afforestation projects. Efforts to restore and establish global forest coverage have many benefits on a chemical, social and biological level. Planting new trees can help to reduce the concentration of CO2 in the atmosphere. Greenhouse gases like carbon dioxide and methane significantly contribute to a changing climate. Forest are an effective, natural carbon sink, soaking up much of the carbon emitted from burning fossil fuels. Reversing global deforestation is a key element of an effective mitigation strategy to fight global warming. A very novel Initiative is underway by a group of women. A woman is a force of nature. When women gather together consciously, lovingly and creatively – anything becomes possible. 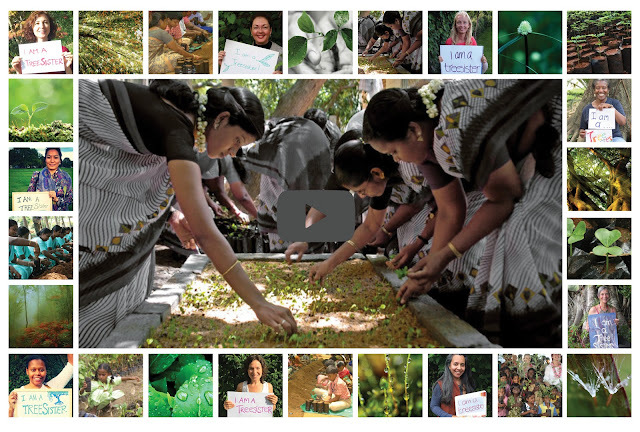 A group of women called as TreeSisters – It’s a nature-based women’s organisation focusing upon the vast reservoir of feminine capacities that are ready to be unleashed into their world to reinstate a global culture of ecological responsibility and care. It’s about caring for nature and environment. They produce online feminine wisdom courses and co-create reforestation funding campaigns. Their courses plug women back into personal power and nature connectedness - inspiring them to make giving back to nature (by funding trees) core to their lives. It’s a registered UK based charity composed of a growing international team of social entrepreneurs, cultural creatives and volunteers, led by an experienced Board of Trustees. So far, TreeSisters have funded 27,400 trees to date and with your support they can grow this exponentially in future also. Imagine a reforestation revolution ignited by the shared creativity and courage of a global network of millions of women - and you are sharing their vision. They aim to help reforest the tropics within 10 years by engaging the unique feminine consciousness, gifts and leadership of women everywhere and focusing it towards that goal. To go to the next level they need to build a state of the art online platform and several short films to activate the ingenuity and generosity of the global community to help normalize monthly giving to trees. They need donation for the new site which will underpin both the social mobilization and practical delivery of their shared ecological impact year by year - eg: 100,000 trees/month by the end of 2016 - which they do by channeling donations into a diverse portfolio of existing tropical tree-planting organizations who they partner with. Over the next 6 months (Sept – March 2016) they are in a massive developmental phase. They need to create the new tree campaign tools and TreeSister group materials, new on-line courses – everything that’s needed to launch in the spring with the clarity, congruence and content needed to deliver both sides of their mission and go to scale fast. Your donation will fund all above and tropical trees planting in India. They are fundraising in earnest to cover our developmental costs so that they can able to deliver a higher and higher percentage of your donation to the trees. They calculate tree funding every three months and let you know immediately how much is being planted. Please help them by contributing generously at their IndieGoGo campaign and becoming part of the family of founding funders. By donating you are underpinning a mechanism designed to deliver long term ecological and behavioural change. You will become part of TreeSisters and receive a nourishing series of welcome emails with gifts and tools to inspire you, as well as invitation to attend the When 1000 Goddesses Gather event to celebrate those answering the call of this campaign. What are you waiting for? Join the Reforestation Revolution of TreeSisters and save our planet...Thanks for the support.